Don't have an Xbox 360? Microsoft has a few good reasons to pick one up right now. Not content with the week or so of success Microsoft has already tapped out of Gears of War, the company said on Wednesday that it is readying a bundle containing the game and an Xbox 360 for release later this month. The new bundle brings you a standard edition of Gears of War and a premium Xbox 360, all for £300 - a saving of around £30. The penny-pinching doesn't end there, though. Online retailers are already knocking more off the price, with Play.com offering it for just £270. Microsoft has said that the bundle will be limited, but there's no word on how many there will be to go around. 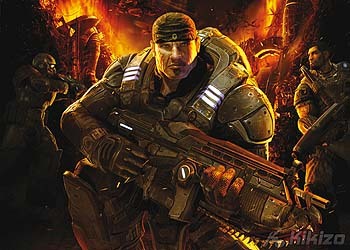 Gears of War looks to be Microsoft's big game for 2006. With no Halo 3 until next year, Xbox 360 owners are turning to the third-person shooter in droves. The game topped the UK sales chart in its debut weekend, and Microsoft announced this week that worldwide sales have already hit 1 million. The game is also making waves online, where it is now the No. 1 game on Xbox Live - finally booting Halo 2 from the spot it's held for the last two years. Microsoft and developer Epic aren't just standing by. In an interview with GameDaily, Microsoft's Jeff Bell said that the company is setting lead character Marcus Fenix up as the hero in an as-yet unconfirmed trilogy. If Gears of War isn't your thing, Microsoft is also planning similar bundles with World War II shooter Call of Duty 3 and tight-pants rumbler WWE SmackDown vs Raw 2007.